Kids Talk — Aspire Indiana, Inc. Kids Talk provides a child-friendly location where children can report sexual or physical abuse, neglect or their memory of a violent incident in a safe and comforting environment. Kids Talk uses a collaborative approach with various county agencies to serve and protect the children of Madison County. Kids Talk also offers a prevention program for students K-12 that educates them on body safety and digital media safety. Click here for the Staying Safe in a Digital World resource page. Click here for Body Boundaries resource page. According to the Indiana Department of Child Services, Madison County has one of the highest rates of substantiated cases of child abuse and neglect per capita in Indiana. These types of crimes are extremely personal in nature and difficult for the victims to discuss. Like adults, child victims experience shame, fear, guilt and embarrassment. Getting a child to overcome these emotions and trust an adult enough to share their experience can be difficult. However talking about it is the first step to providing safety and healing for the child. Bringing the system to the child, by providing a single location for interviewing children. Utilizing a certified, forensic interviewer who can meet the informational needs of all investigative professionals involved while remaining child-focused. Facilitating a collaborative approach among agency investigative professionals that results in effective, efficient and child-centered casework. Ensuring that parents or caregivers of the children are guided towards programs that will facilitate the healing process for the child and family. Volunteer: Kids Talk occasionally needs volunteers to help with events, office cleanup and organization, or minimal clerical assistance. Due to the nature of our business, volunteers must pass a criminal background check and DCS background check (at our expense) in order to volunteer in our office. Host a Drive: Do you belong to a group who could orchestrate a drive to collect needed items for Kids Talk? If so, contact Denise Valdez at 765-641-8202 for a list of current needs. Donate Items: Kids Talk can always use items such as juice boxes, kids’ snacks, sodas, water, individually wrapped chips and candies, kids’ journals, new throw blankets, new toys, recent magazines for teens and adults, kids’ books, and packs of blank DVD-R disks. To see other needs, please find our wish list at Walmart. Just select the items you’d like to purchase for the program. To receive a receipt for charitable donations, please email your contact information to denise.valdez@aspireindiana.org. Donate Money: Kids Talk is a program that operates entirely off of donations and grants. No fees are charged for our services. If you are able to make a donation, please contact Denise Valdez at 765-641-8202. Thank you! 2017 STAND UP FOR KIDS! On September 9, 2017, a record-breaking crowd of 370 filled the ballroom of the historic Paramount Theatre in Anderson for Kids Talk’s 3rd Annual Stand Up For Kids fundraiser. 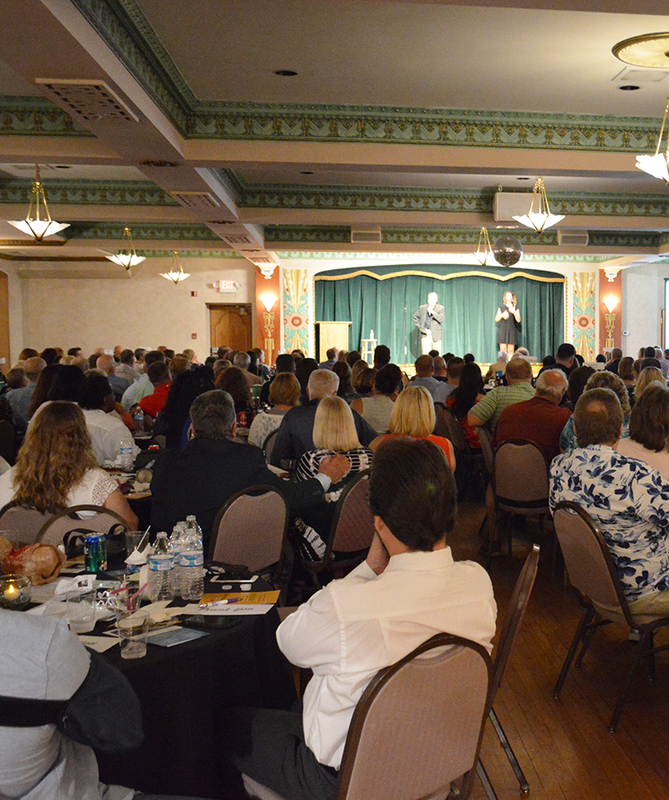 The night of clean stand-up comedy, delicious food, and silent auction brought in $35,000 for Kids Talk, Aspire Indiana’s Child Advocacy Center in Madison County. The headline comedy act was top Indiana comedian Dave Dugan, known for his self-deprecating sense of humor and his observations about everyday life. John Branyan elicited much laughter with his witty humor and his hilarious Shakespearean rendition of The Three Pigs. Branyan and Dugan’s performances were made possible by title sponsors Community Hospital and St. Vincent Anderson. Click here to see more photos from the 2017 Stand Up for Kids! event. Click Here to the 2016 Stand Up for Kids! event starring Jeff Caldwell and Shawn Reynolds with host Alex Valdez. Click here to see the 2015 Stand Up for Kids! event starring Heywood Banks, Dave Dugan, and host Alex Valdez.